Domain testing is the most widely taught technique in software testing. However, many of the presentations stick with examples that are too simple to provide a strong basis for applying the technique. Others focus on mathematical models or analysis of the program’s source code. The Domain Testing Workbook will help you develop deep skill with this technique whether or not you have access to source code or an abiding interest in mathematics. 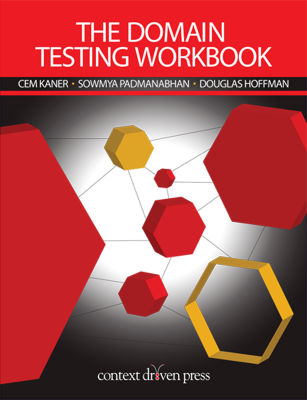 The Domain Testing Workbook provides a schema to organize domain testing and test design, with dozens of practical problems and sample analyses. Readers can try their hand at applying the schema and compare their analyses against over 200 pages of worked examples. how to use domain testing in an exploratory way. Trainers and professors interested in adding depth and skill-based learning to black box testing or test design classes. Cem Kaner, J.D., Ph.D., is Professor of Software Engineering at the Florida Institute of Technology. Dr. Kaner is senior author of Testing Computer Software, Lessons Learned in Software Testing and Bad Software. The ACM’s Special Interest Group for Computers and Society presented him with the Making a Difference Award in 2009 and the Software Test Professionals presented him with the Software Test Luminary Award in 2012. Kaner was a founder of the Association for Software Testing. He is lead developer of the BBST™ (Black Box Software Testing) courses and courseware. Sowmya Padmanabhan, M.Sc., currently works at Google as a Program Manager. Before that she worked in Program Management and Software Development/Test at Microsoft and at Texas Instruments. She has a Masters degree in Computer Sciences with a specialization in Software Testing. Sowmya’s thesis involved extensive research in training new testers to do skilled Domain Testing. Douglas Hoffman, M.S.E.E., M.B.A, is an independent management consultant with Software Quality Methods, LLC. He is a Fellow of the American Society for Quality. He has authored numerous papers and is a contributing author of Experiences of Test Automation. He has taught several courses on software testing and test automation for the University of California’s Extension campuses. He has served as President of the Association for Software Testing and of the Silicon Valley Software Quality Association and as Section Chair of the Silicon Valley Section of ASQ. Also available as a Kindle version! Order your copy from Amazon.